Painting a room requires more than just a can of paint and a paintbrush. While you could get by with just these two items, you may not be happy with the results. Purchasing the right tools and equipment will help protect other surfaces, create smooth lines, and simply make your next painting project go a lot more smoothly. 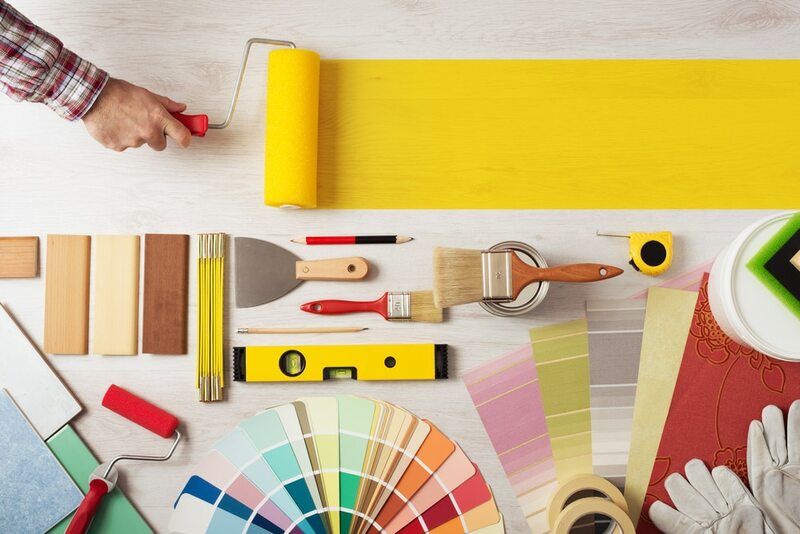 Here are the top tools that you should purchase before you start painting. Unless you are tall and live in a house with low ceilings, you will need a ladder or step stool. If you need to extend your arms completely to reach the tops of the walls or ceiling, you may have trouble applying even strokes with the paint brush. You will also likely tire yourself out quickly. Never try to stand on a chair or table to get a better reach. Use a ladder to get closer to the ceiling. If your ceiling is low enough, you may get by with a sturdy step ladder. For painting walls and ceilings, you will save a lot of time and effort using a paint roller. You will still need the brushes. However, you can use the roller for applying paint across most of the wall or ceiling. Inexpensive rollers will need to be replaced with refills occasionally during your paint project. However, a quality roller may last through several paint sessions, as long as you remember to rinse it out properly after each use. The paint roller is best for covering large surfaces. However, you will likely need a paintbrush for painting the edges and around the corners. You will also need a brush when painting trim and window sills. You do not need a wide variety of brushes for a typical painting project. For most projects, you should be fine with a 2 or 3-inch flat sash brush and a 1.5 or 2-inch angled sash brush. The flat brush is best for painting flat surfaces, such as the edges of the walls or ceiling, while the angled brush is useful for painting near corners. A paint tray is necessary for most paint jobs. While you could simply dip a paintbrush in the paint can, you will likely make a mess. You also need a tray if you plan to use a roller. The best trays have a rigid surface in the middle to help remove excess paint. If you need to keep any furniture or appliances in the room, cover them with drop cloths. You do not need to spend a lot of money on these drop cloths. Disposable plastic cloths should provide the protection you need, and they can be used to cover any items that you leave in the room. Whether you are painting a hallway, bathroom, or bedroom, you will likely need painter’s tape. This tape is mostly used to create straight lines and protect trim, window frames, and door frames. Do not try to save money and tape off trim and ceilings with masking tape or duct tape. Painter’s tape is designed to provide a tighter seal and prevent paint from bleeding through. These are the main tools that you will need for your painting project. However, depending on the project, you may need a few additional items. For example, sandpaper may be needed to help smooth rough surfaces or to remove paint. You may also need putty to fill in holes or cracks on the drywall.